The Decameron is a collection of a hunred novellas, written by Italian writer Giovanni Boccaccio around 1350. Mostly composed by bawdy tales of love in all its forms, this book played an important part in the history of novels. Its title comes from ancient Greek and means literally “ten days”. The scene opens with a description of the plague, which was invading Florence in that years. Then, the author presents us the main characters, seven young women and three young men, who decide to escape from the plague refuging themselves in a villa outside the city walls. To let the time pass, each member of the group shall tell one story for every one of the ten nights spent at the villa. One of the women, Pampinea, is elected Queen for the first day. Each day the company’s previous king/queen elects who shall succeed them and nominates the theme for the current day’s storytelling. Each day has a new theme assigned to it except for days 1 and 9: misfortunes that bring a person to a state of unexpected happiness; people who have achieved an object they greatly desired, or recovered a thing previously lost; love stories that ended unhappily; love that survived disaster; those who have avoided danger; tricks women have played on their husbands; tricks both men and women play on each other; those who have given very generously whether for love or another endeavor. Boccaccio gives introductions and conclusions to each story which describe the days activities before and after the story-telling. These inserts frequently include transcriptions of Italian folk songs. The work presents many interesting philosophical aspects. Above all, the medieval concept of Lady Fortune who can be good and bad for everyone, who lets people rise and fall continuously in her weel. 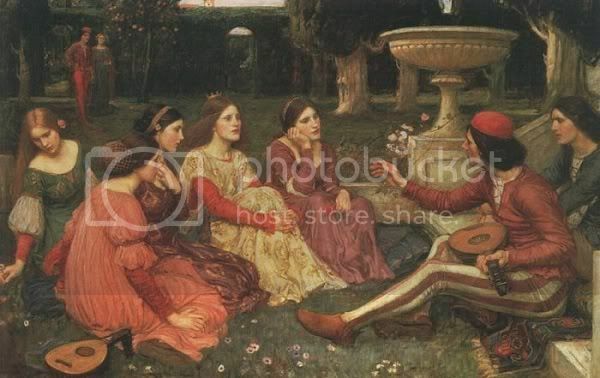 Many of the Decameron’s details have a medieval medieval sense of numerological and mystical significance; for example, the seven ladies are believed to represent the Four Cardinal Virtues (Prudence, Justice, Temperance, Fortitude) and the Three Theological Virtues (Faith, Hope, and Charity) and the three young men are the classical Greek tripartite division of the soul (Reason, Spirit, and Lust). The masterpieces of the Italian litterature can be analysed and studied according to your wishes in our Italian language courses.